The biennial atom probe community meeting was attended by Steve Reddy and David Saxey. A wide range of research was presented from the Geoscience Atom Probe facility, including an overview of atom probe geoscience applications presented by David in the 2018 Honorary J.H. Block Memorial Lecture. 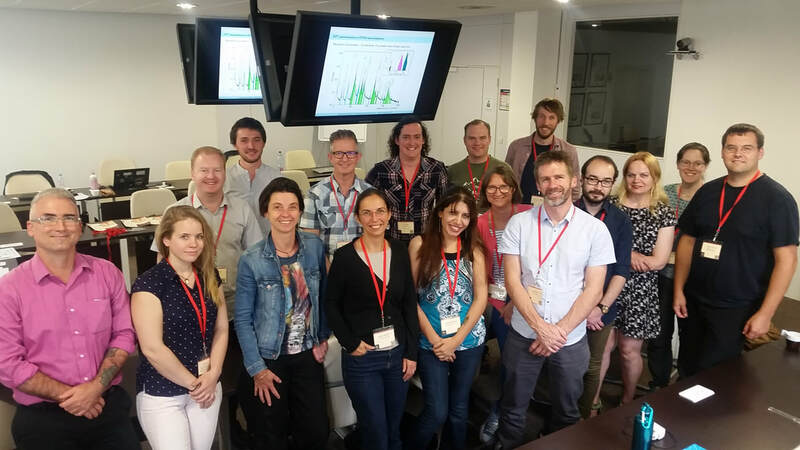 The Geoscience Atom Probe Group, together with Anne-Magali Seydoux-Guillaume (CNRS, Jean Monnet University, St Etienne), held a workshop on ‘Nanoscale Correlative Microscopy for Geoscientists’ prior to the 2017 Goldschmidt Conference in Paris. ​The workshop presented an overview of several nanoscale analysis techniques of use to geoscientists, including EBSD, transmission-EBSD, high-resolution SEM and TEM, FIB-based ToF-SIMs mapping, and Atom Probe Microscopy. About 25 delegates attended the two-day meeting, which allowed for some thorough discussions of the different techniques and examples of their application to geoscience research problems. Thank you to all those who attended and presented at the workshop, for making it an interesting and successful meeting. "Nebula sulfidation and evidence for migration of 'free-floating' refractory metal nuggets revealed by atom probe microscopy”, recently published in Geology, has revealed the incorporation of sulphur into some of the first solid material to have condensed during the early stages of solar system formation. This has significance for the dynamics of the photo-planetary disc, prior to and during formation of the planets, and reveals some of the first geochemical evidence for large solar-system-wide transport processes that were at work during this early phase. The Geoscience Atom Probe Facility makes its first foray into the emerging field of nanogeochronology. Using the Cameca LEAP 4000X HR, nanometer-scale reservoirs of radiogenic Pb were visualised and dated to obtain a zircon crystallization age and show the mechanisms responsible for zircon discordance. 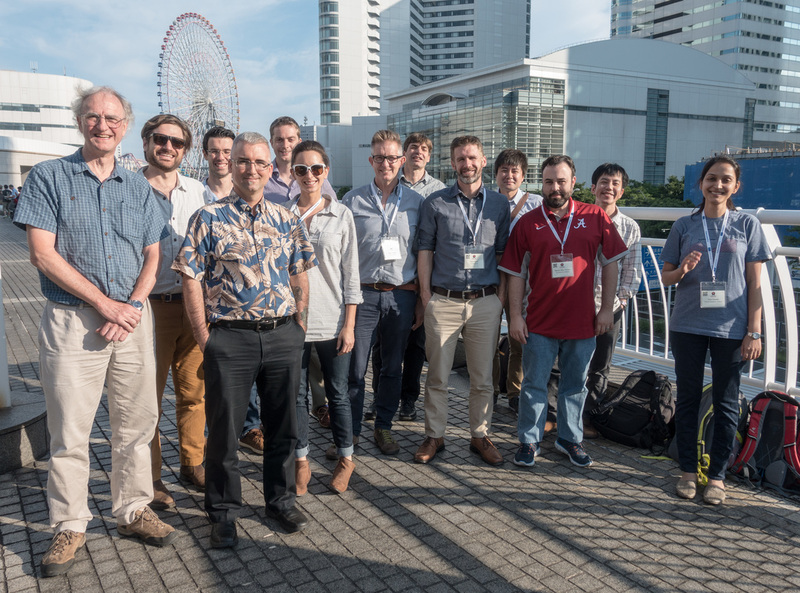 Steven Reddy, David Saxey and colleague Alberto Perez-Huerta (University of Alabama) recently ran a successful two-day workshop on "Atom Probe Microscopy for Geoscientists" as part of the Goldschmidt 2016 meeting in Yokohama, Japan (25-26th June 2016). 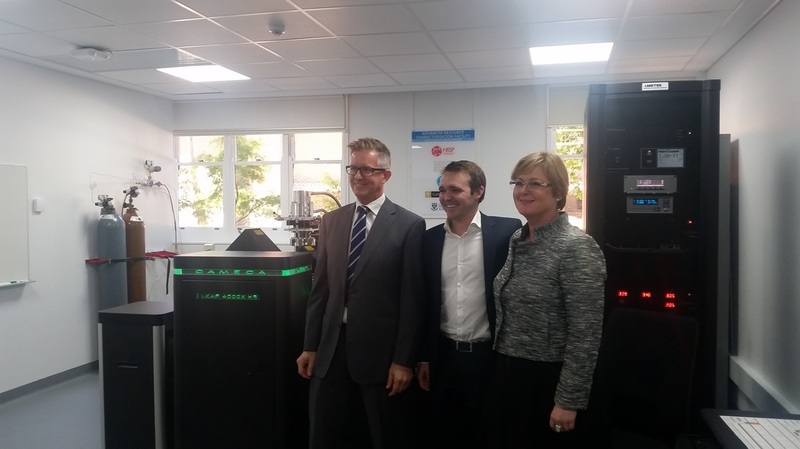 15 Dec 2015 - Assistant Minister for Innovation Wyatt Roy MP and Senator Linda Reynolds visited the Geoscience Atom Probe during an ‘innovation tour of Perth’. Professor Steven Reddy, Assistant Minister for Innovation Wyatt Roy MP, and Senator Linda Reynolds. Opportunities to apply for a PhD project within the GAP facility will arise from time-to-time. Information will be posted here when available.